The billboards range from explicit ads for attack helicopters and combat vehicles to more subtle billboards for companies such as little-known DRS, owned by Italian weapons maker Finmeccanica and 26th among the top 100 Pentagon contractors, or for “rugged” Dell computers designed to meet Defense Department specifications for military-use. An estimated 17,000 Capitol South metro passengers are confronted daily with Northrop Grumman Global Hawks and X-47 Unmanned Combat Aerial Vehicles, which boast a 4500-pound weapons bay, E-2D Advanced Hawkeyes, Viper Strike-armed Fire Scout unmanned helicopters and E-8C Joint Surveillance Target Attack Radar Systems (STARS), all designed “for an unsafe world.” According to the centrist Brookings Institute, 90% of drone casualties in “targeted” strikes in Pakistan have been innocent civilians. Yet ads for these systems, which carry price tags ranging hundreds of millions of dollars when factoring in development costs, are on full display. 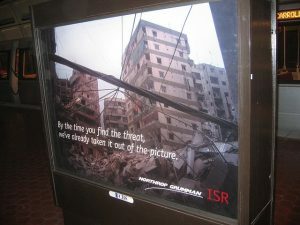 Perhaps most startling of all the Capitol South billboards is the ominous scene of a bombed out apartment building above the slogan “By the time you find the threat, we’ve already taken it out of the picture.” Northrop Grumman fails to fill us in on what happened to the people living in those apartments. Following the trend of major defense companies wishing to cozy up to powerbrokers in Congress and at the Pentagon, Northrop Grumman recently announced plans to relocate its California headquarters to the DC area. Officials from Washington, Virginia and Maryland have been falling over themselves trying to influence the decision of the $34 billion company. The District of Columbia has gone as far as offering a $25 billion incentive package for what Northrop Grumman estimates to be a measly 300 jobs, which will be filled primarily by company executives moving from Los Angeles! The defense contractor presence on the DC metro is but one example of the ubiquitous signs of militarism in Washington. Standing out like sore thumbs, military personnel dressed in camouflage can be seen everywhere from the food court at the shopping mall to the line at the bank. Combat fatigues were ordered everyday wear for all service members, including those with desk jobs, following the September 11, 2001 attacks. I asked several camouflaged service members the reason behind the combat uniforms and all sheepishly replied that is was in support of the “troops in the field.” One woman told me, “That’s a good question. You feel kind of funny wearing this.” Looking down at her desert boots, she said, “It’s not exactly office wear.” But it is a clear and constant reminder that the nation continues to be on a war footing. Signs calling for support of the troops can be found on everything from restaurant walls to dump trucks. Cheering on the “troops in the field” is also the Liberty gas station on Columbia Pike in Arlington. Directly above the gas pumps is a red, white and blue sign that reads “Support Our Troops.” This is either the result of disturbingly twisted logic or an astonishingly candid call for protecting U.S. access to Middle East oil reserves. At Union Station, Amtrak passengers should not be surprised if a soldier or two cut in line. Signs in the station invite uniformed military personnel to skip to the head of the ticket line. According to Amtrak, which is the only Department of Defense approved rail passenger carrier in the US, it is a way for the company to “extend their thanks.” That’s all and good but why wouldn’t Amtrak want to do the same for teachers, healthcare professionals, firefighters, librarians or non-profit volunteers? Much of this is not necessarily new; the militarization of our society has been progressing for decades, permeating our schools, research and development programs, law enforcement and culture. And despite the heavy concentration in Washington DC, the phenomenon is certainly not limited to the nation’s capital. The signs of militarism in our country are ever-present to the point of becoming virtually invisible, while subconsciously persuading us to accept violence and war as not only a suitable solution to conflict, but the only one. The fighter jets and missile-firing drones are anything but invisible to the people in Iraq, Afghanistan and Pakistan. Let’s rebel against their apparent “normalcy” here in the US. As a start, contact Dan Langdon, CBS Outdoor’s Vice President and Regional Manager letting him know that ads for deadly weapons systems have no place on the DC metro, or anywhere else for that matter!